Have you ever wanted to make a change in someone’s life? Students may have the chance to make a small difference in someone’s life at Rocky Mountain College’s Respect Rally, being held on March 2 on the RMC Green from 11:00 am to 3:00 pm. The Rally’s mission is to encourage people to stop using the “R” word, or “retard(ed),” and to make students more aware of the words they use in everyday conversation. 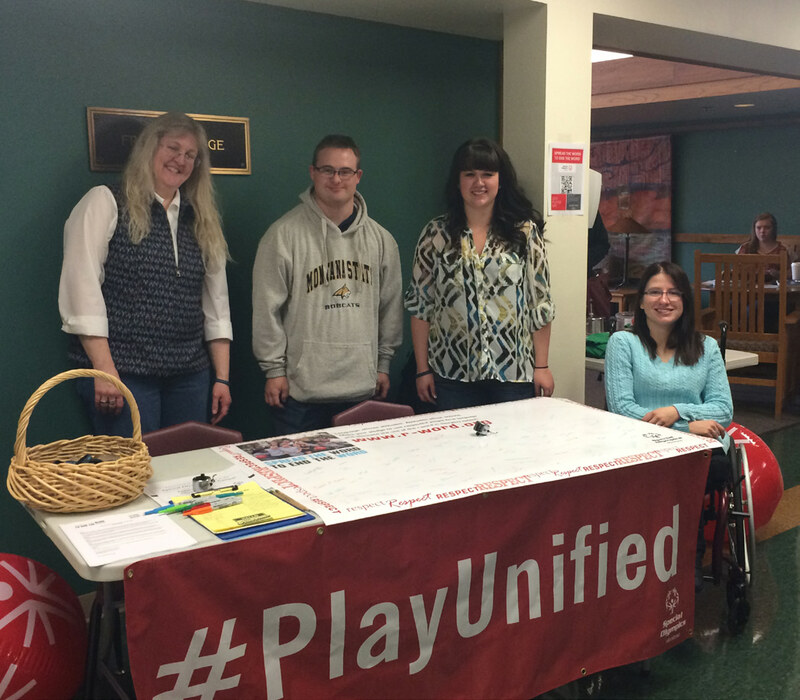 For those who would like to do more than take a pledge, RMC will also be hosting part of the Special Olympics Montana (SOMT) Area Games in late April. Students, faculty, staff, and community members are encouraged to come and cheer these athletes on as they are competing throughout the day. Last year, RMC held its first event for National Pledge Day, a day where people pledge to stop derogatorily misusing the word “retard(ed).” is event became known around campus as the Respect Rally. In 2015, 80 people, including staff, faculty, community members, and RMC students took the pledge to stop misusing the “R” word and to start thinking about respect. The event first came about when RMC sophomore Emily Schaff reached out to the regional director of the Special Olympics for the Montana area, Jami Williamson. Schaff continued to build relationships with employees and volunteers for the Special Olympic Programs, and eventually the Respect Rally was born. Students who take the Pledge will receive a #respect406 shirt and are welcome to tie-dye it if they choose. Students who receive a t-shirt are encouraged to wear their shirt on #ThrowbackThursday, March 3, to keep the idea of respect continuing. SOMT athletes and employees will be at the event so that people can have a chance to talk to them about their experiences and to get to know some of Montana’s Special Olympics competitors. Everyone is encouraged to come and attend the Respect Rally if they can. Make a difference by taking the pledge to stop using the “R”-word derogatorily and start thinking about respect. If anyone would like to volunteer at the Respect Rally on March 2, or the Special Olympics Area Games on April 29 and 30, contact Emily Schaff at emily.schaff@rocky.edu.